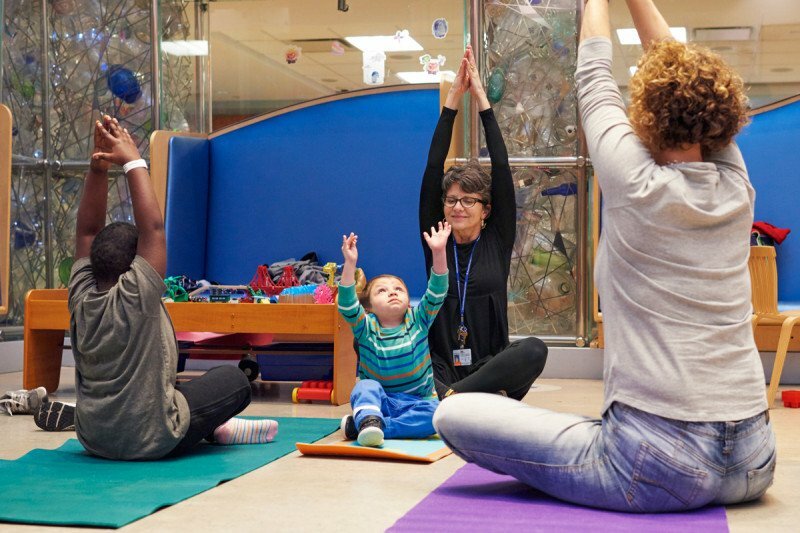 Pediatric patients and their caregivers can participate in yoga and other recreational activities. A diagnosis of Wilms’ tumor can be overwhelming. Our experts understand the symptoms and possible side effects of treatment, including the social and psychological aspects of therapies needed and recovery. You may find it helpful to speak with other patients or families who have had similar experiences with Wilms’ tumor. Please ask your child’s care team to arrange for you to speak with some former patients and their families. Children recovering from Wilms’ tumor treatment may need rehabilitation therapy. We offer physical and occupational therapies in inpatient and outpatient settings for our pediatric patients. Our child and young adult patients may also benefit from the therapies offered by our Integrative Medicine Service, which support mainstream medical care by addressing the physical and emotional symptoms of cancer and its treatment. We offer music therapy, mind/body therapies, dance and movement therapy, yoga, and other services for our inpatients and outpatients in groups or at the bedside.